With some creative thinking, you can turn your backyard into the ultimate play space! Here are our tips to help you refresh and renew your backyard, just in time for spring. Swing sets are great since they can accommodate children of various ages. Not only will your little one be happy with this addition, but so will their neighborhood friends. Multilevel structures can be considered a great investment since they’ll grow with your child and provide entertainment as they continue to grow. If you have children of varying ages, you can even add in a toddler swing that prolongs the life of the structure even more. Not only is water play refreshing as the weather warms up, but it’s also the perfect addition to the ultimate backyard. Ready to commit to something permanent? Add an in-ground pool! Don’t have space for an in-ground pool? Inflatable kiddie pools are a great alternative. They’re easy to set up, fun to play, and easy to clean up and store. No backyard is complete without a water table though! These tables are easy to set up and can be another way to add water play into your backyard. Adding a water feature of some sort will bring entertainment for the whole family and definitely a must-have. If you’re ready to bring ultimate fun to your backyard it’s time to start thinking outside the box. Turning your backyard into a mini amusement park is the perfect way to do this! Adding fun toys like a Toy Roller Coaster can add a fun and unexpected twist to anyone’s backyard. Your children will have hours of fun with this addition and so will all their friends! You can’t have the ultimate backyard if it’s not safe! If you decide to add a swing set structure, then having the proper ground is critical. Trust us, there is nothing fun about having a child get hurt while trying to have fun. Cedar chips or approved safety tiles are both smart options for soft landings. Different play surfaces can also add different play elements. If you have a paved area, your little ones can play basketball or let their creativity go wild with sidewalk chalk. 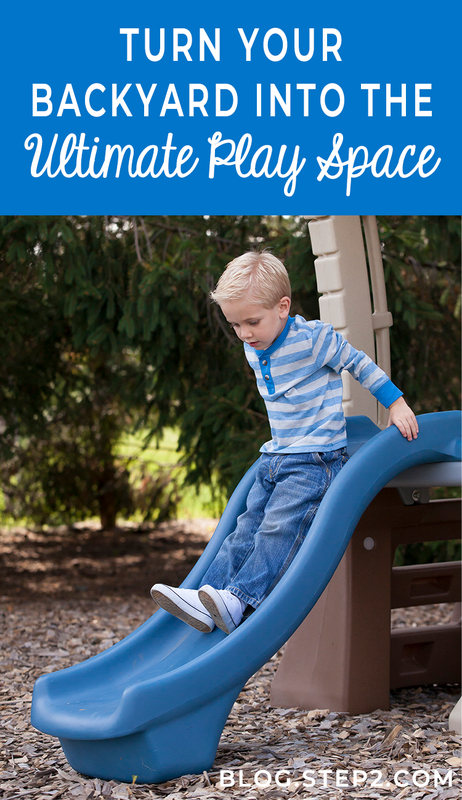 It’s important though that your play space promotes safe play, and creating a barrier is a great way to do it. Barriers, such as fences, prevent strangers from entering and give your children safe boundaries. There are so many ways you can start turning your backyard into the ultimate play space. It just takes a little imagination to bring your dream to life. You can mix and match different features to make the perfect backyard that meets you and your little one’s needs. What are you waiting for? Get out there and get playing!